The pins will bow down before the King with the Kingpin Rule. The King is back and this time, stronger than ever. Wrapped around the outside is the ECA-XR solid coverstock, the same cover as seen on the Quantum Bias. Finished to 500/2000 Siaair Micro Pad, the Kingpin Rule is the perfect arsenal piece for heavy oil conditions. 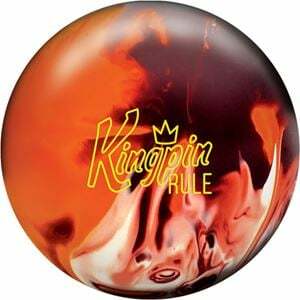 Inside, the Kingpin Ultra Low RG with DynamiCore technology, as previously seen in the Kingpin Rule's predecessors, you can expect MORE hook and backend with insane carry. Show the competition who RULES.